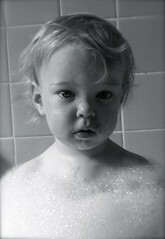 As we move into summer and the apartment heats up for June it means more kids taking baths more often. Some times it seems that the bath tub is in as frequent use as the computer. These baths have nothing to do with getting clean. They are purely recreational. Our tub is extra big and long so for the littlest ones it is more like a pool than a bath tub. We have not had any overflow misshaps lately but more than once this past year our poor tortured nieghbor downstairs has called to let us know in very clipped and angry terms that water is dripping through his ceiling! Lately bubble baths have been all the rage and sense we never think to actually buy some sort of bubble bath soap, large quantites of shampo make the sudsy miracle happen. Any shampoo in reach, the cheap baby shampoo of the expensive stuff that Rose uses her Sock Monster money to buy. One day Dove had figured out how to create steam with the shower and the hot water to give bathroom play time a whole new sort of sweedish dimension and mystery. With all this bathing don't think for a minute that they are every actually very clean. With the exception of Rose and Pearl who have begun to take great attention to their personal apperance, all the others seem to live out their lives decorated in chocolate smears, magic marker tatoos along the lines of Cy Tombly and their clothes stained and clotted with the remains of their last meal. I think this is childhood I am witenssing in all its mess and glory. And it has very little in comon with the photo shoot perfection we are bombarde with from the magazines that litter the floor of our house. Except when I am pissed off for have to pick up yet another clump of heavy wet towels and bath tub toys for the umpteenth time I love the fun the children make out of just about every single aspect of their uncomplicated lives.